This never-worn (except for these pictures) 100% chartreuse silk two-piece outfit is by Norma Kamali. It has a 100% acetate light lime sherbet lining. The jacket/blouse has a big shirt collar with a V neckline and 3 buttons down the front and is sleeveless. You can wear it in or out or mix and match. The skirt has a left side 6 1/2" long zipper. The tag says 12-top, 14-skirt. The outfit was made in the USA. It has really nice raw silk texture and striking color. She got it as a birthday present from her boyfriend, but she sold it because she needed the money. 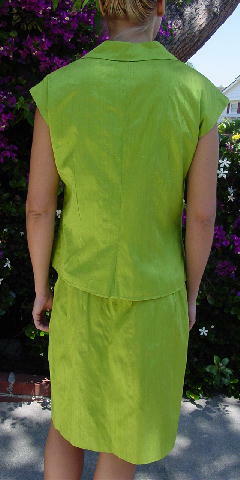 shoulder to shoulder 20 3/4"
shoulder to hem 22 1/4"
side to side bottom hem 20 1/4"
waist to hem 19 1/2"